1. In a large pot, add water and bring to a boil. Place steamer overtop. Steam Swiss chard for 2 minutes, then rinse under cold water and squeeze dry. Alternatively, you could blanch the chard for 1 minute in the boiling water). 2. In a second large skillet over medium heat, add the oil. Once hot, add the onion and saute until it becomes transparent, around 5-8 minutes. Add the garlic, paprika and chile flakes, stirring for approximately one minute, until the spices are fragrant. 3. Next, add the tomatoes and salt to taste. Bring to a simmer and simmer until the tomatoes have cooked down slightly, around 10 minutes. 4. 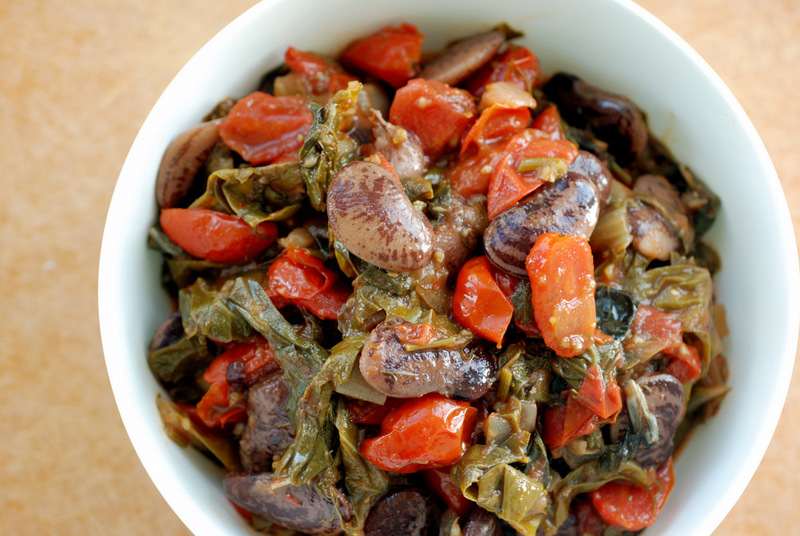 Stir in the chard, herbs, diluted tomato paste and cooked lima beans and return to a simmer. Simmer until the greens are very tender, around 20 minutes. Season with salt and pepper, to taste. That is a ton of spinach! I once saw a 5 lb bag of mixed baby greens for $5 or something.. it was huge! I refrained, figuring there was no way I could possibly eat it all! I do the same thing with greens when I need to eat my through a lot of them- cook them down and happily eat a bunch in one sitting 😉 This meal sounds so fresh with the mint and dill! I’ve never had those 2 herbs together before- I must try it! What’s not to love about this recipe? 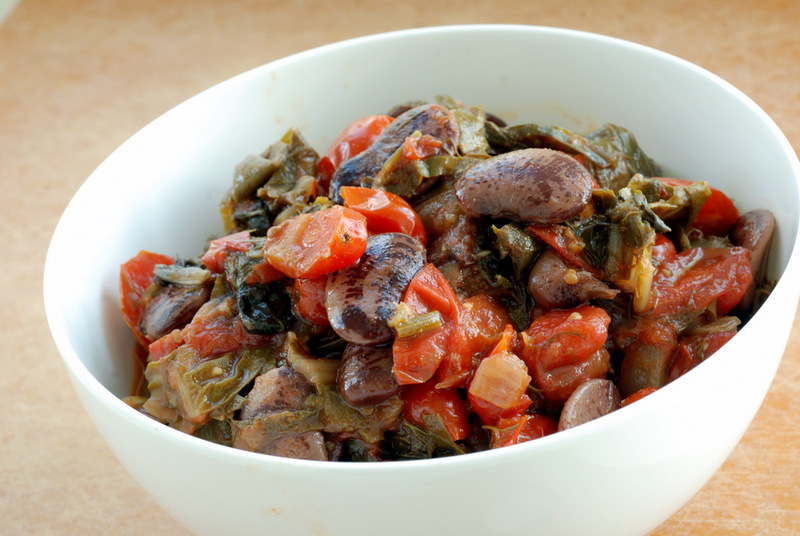 Lima beans (favorites), greens (yum), and mint (inspired)…a terrific blending of flavors and textures. Thanks for sharing! GREENS! I’d be buying more & more too if I ever found any for 2 for $1. I tend to go more for the quick saute than the long braise or stew, but any way you cook then, they’re still great. I especially like the paprika, mint, and dill combination–sounds intense! I never eat lima beans but I swear I think I have some at home. as usual…YUM! I love greens so much that lately I’ve taken to throwing them into any and everything! You can never have too many. 🙂 This reminds me of the greek dish gigantes plaki but without feta cheese! No need for it here…looks so tasty! I hear you on the greens; I’ve got Swiss chard, kale, dandelion, and three lettuce types in my fridge right now. And that doesn’t even begin to cover the herbs… I also love limas, as these are beautiful (I keep meaning to order some heirloom varieties from Rancho Gordo, as I think they’re shipping to Canada now). This is the kind of thing I love to smell burbling away on the stove on the weekend, knowing I can eat it whenever I like over some brown rice. I’ve got my eye on this one for Sunday!